Anni Brogan, owner and president of Micro Aerodynamics, inspects vortex generators ( VGs ) on the wings of a small aircraft used in studies by ARS engineer Dan Martin. Agriculture Gets an Aerodynamic Boost! ARS engineer Dan Martin found that the dime-sized metal clips can help ensure more accurate targeting of pesticides. 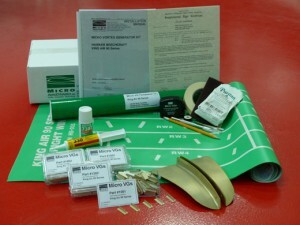 Brogan’s firm Micro AeroDynamics Inc. provided MicroAero VGs used in the research. Vortex generators (VGs) are common on commercial airliners as well as on smaller aircraft to provide pilots better control of the aircraft. Now, thanks to Martin and others, VGs are reducing the drift of pesticides sprayed by agricultural aircraft. “It’s a matter of aerodynamics,” Martin says. An airplane gets lift from an area of high pressure passing under the wings and an area of low pressure passing over them. But as air passes over and under the wings, it moves up and around them in chaotic whirlwind patterns, particularly at the wing tips. VGs are T-shaped, and when they are attached to the edge of the wing, each one becomes a focal point (a vortex) that stabilizes the flow of air as it passes over and under the wing. On most agricultural aircraft, the spray nozzles are attached to booms that hang below the wings. VGs make for a smoother and more controlled flow of air below the wing near those nozzles. “VGs channel the air flow and concentrate it so that it pushes the spray down towards the crop canopy,” Martin says. VGs also are often attached to the plane’s rear stabilizer to produce the same beneficial effect. The overall effect is less pesticide drifting off target. Martin started evaluating VGs a few years ago in an effort to reduce spray drift. He and his colleagues sprayed a target field near College Station to measure drift and deposition rates of a test spray released from a plane. They placed moisture-sensitive cards at various distances outside the target to measure downwind deposits. 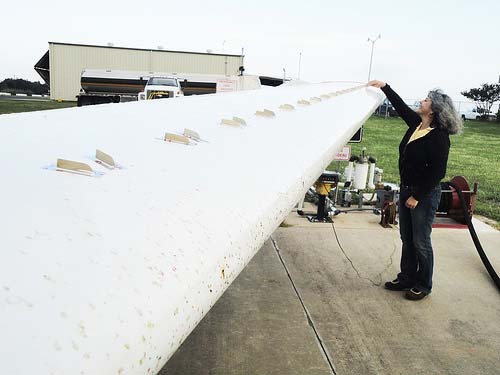 The results showed that the type of clips used in the study, Micro VGs, produced by Micro Aerodynamics, Inc. of Anacortes, Washington, dramatically reduced downwind deposits and drift.